A cluster of Australian engineering students at Swinburne University of Technology have invented a robot, named Ruby, that can solve a Rubik’s Cube in the world record time of 10 seconds. Getting the puzzle solved in a robot poses two difficult problems: working out the solution really quickly, and having the robot move the pieces fast enough. Ruby works scans each face of a scrambled cube through a webcam. It then develops its solution in software, feeding this to a high-speed robot through a real-time embedded control system. The Ruby bot was built by six students as their final year project for the double degree in Bachelor of Engineering (Robotics and Mechatronics)/Bachelor of Science (Computer Science and Software Engineering). The team is applying to have Ruby's Rubik's-solving skill recognised by Guinness World Records. The current human world record for single time on a 3×3×3 Rubik's Cube is held by Feliks Zemdegs who had a best time of 6.24 seconds at the Kubaroo Open 2011. 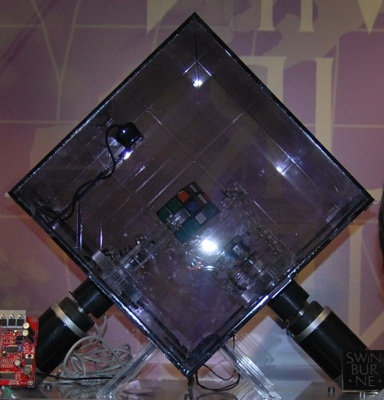 As of October 2010, the world's fastest Rubik's Cube solving robot, the Cubinator, was able to solve a scrambled Rubik's Cube in 18.2 seconds.